Things have changed for seventeen-year-old Zoe ever since the otherworldly events that brought her together with the mysterious bounty hunter she calls X. In order to save Zoe and her family, X has done the unthinkable – he’s given up his freedom and returned to captivity in the Lowlands. X is determined to break the lords’ hold on him once and for all, but being stripped of his power pushes him toward a darkness he’s never experienced and a past he’s never known. The secrets that surface could be the key to reuniting X and Zoe… or they could mean the destruction of everything they have been fighting for. 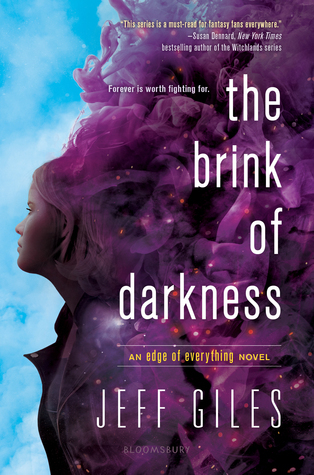 Gripping and full of heart, this epic continuation of Jeff Giles’ series – which already has rave reviews from New York Times bestselling authors Kami Garcia, Melissa de la Cruz, and Cassandra Clare, among others – will bring readers right to the edge of everything. When the book arrived, I was a little confused as to what series it belonged to since the cover is so different to the first one! I’m just going to take a moment to appreciate the new cover omg, the colours look SO NICE! Buuuuut, I love it when my covers match, so I was a little sad they changed the style of the cover for both books. I read the first book in the series last year (you can read the review here!) and quite enjoyed it, so I was excited for the second book. I had a few expectations as to writing style and story, and I think my expectations were just a tad bit too high. I did enjoy this book, but not as much as the previous one. The plot here seemed a bit strangely paced, and I felt like nothing was really happening, and then suddenly too much was happening in such a small span of time. I took my time and read the book relatively slowly, but I still felt like it was rushing me to finish reading. The pacing of events was way too quick and I get that the author may not want to waste pages on transitions or fluff, but honestly a little bit more descriptions or explanations on why things were happening would’ve made the book a lot better in my opinion. There were a couple of scene transitions between chapters that didn’t make much sense to me, and I didn’t know whether they were actually happening in the story or if they were a flashback or something like that??? This instalment took us to the Lowlands, and I was so intrigued with the idea of spending a little more time there, but I felt like the descriptions were a little lacking. I mean it could’ve been my fault for missing or not remembering major descriptions, but the picture I had drawn in my head was so vastly different to what it actually was, and when little details came up I had to keep shifting the mental picture. Not a biggie, but it took a little bit away from the reading experience. As I said in the review for the last book, I’m not a fan of how the romance between Zoe and X causes them to both suddenly drop everything for each other. I didn’t like how obsessed they were with each other, like a little bit is fine and perfectly normal, but it felt like way too much in this book. This isn’t set too long after the first book, so it’s still very new and very insta-lovey. I did, however, enjoy the character development that we got to see. Zoe came off as quite selfish in the beginning of the book, so it was nice to see how she grew. I also really enjoyed the scenes where X was interacting with Zoe’s friends! I had a few giggles throughout the book. One major thing that bothered me about the book was that it was very, very convenient. Everything that happened seemed more convenient than like it was cleverly planned to be that way, if you get what I mean?? I don’t want to say anything too specific to avoid spoiling the story, but towards the end of the book things started conveniently happening, and things were linking together in weird ways that didn’t sit right with me. Overall, the book wasn’t amazing but it wasn’t terrible. I’m not too sure if there’s going to be a third book (if you know, please let me know! ), but if there is I’ll read it. If there isn’t, I don’t mind either. If you enjoyed the first book in the series then I recommend continuing with caution, because I just felt like this fell a little flat in comparison. Jeff Giles grew up in Cohasset, Massachusetts. Most recently, he was the deputy managing editor of Entertainment Weekly, where he oversaw all coverage of movies and books, including the magazine’s championing of YA fiction. Jeff has written for Rolling Stone and The New York Times Books Review. He also coauthored The Terrorist’s Son, a nonfiction book that won an Alex Award from the American Library Association and has since been translated into more than a dozen languages. While reporting on the Lord of the Rings movies for Newsweek, Jeff was invited to be an extra in The Return of the King. He played a Rohan soldier, and–because he didn’t have a beard or mustache–they glued yak hair to his face. Jeff lives with his family in Montana. I was surprised by ‘The Edge of Everything’ because The Lowlands and supernatural bounty hunters is about the coolest thing I have ever heard of. But then I tried to read the sequel and just… couldn’t get into it. A year had passed. I had forgotten so many details already. It’s kind of bummer that The Lowlands weren’t more detailed. The concept holds so much potential! I understand where you’re coming from! The details were a little bit blurry at the beginning but I remembered more as I got into it 🙂 Very true! I’m hoping that we’ll get a better description if the story continues, although it’ll be a little bit late!